With our Disney trip planned and booked, and armed with the knowledge of which are the best rides for young kids in Disneyland Paris, I turned my attention to the other all-important factor where kids are concerned, food. Nobody wants ‘hangry’ kids on their hands, especially in Disney. As we were going with friends, and although we weren’t staying in the same hotels, we would be eating at least lunch and possibly dinner together. We had booked a Plaza Gardens character breakfast for one morning but apart from breakfast, we hadn’t thought about meals later in the day. But anyone who has gone to Disneyland Paris with kids will know, where food is concerned, it’s a veritable minefield, especially if it’s your first time. 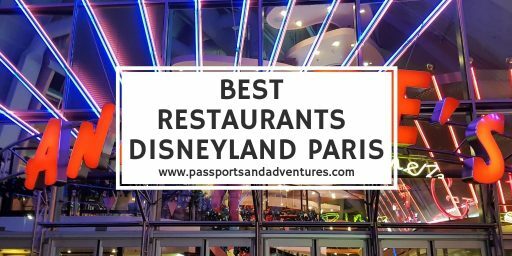 I wanted to know which are the Disneyland Paris best restaurants and of them, which are the best places to eat in Disneyland Paris. I have heard many stories complaining about the cost and quality of the Disneyland Paris food. I had also heard that the best restaurants, Disneyland Paris, are almost impossible to just walk into. And this led me to start to wonder whether we would be able to enjoy some of the best restaurants at Disneyland Paris. So, before we went and to help us plan our food better, I turned to the blogging community for their recommendations on where to find the best food at Disneyland Paris, and here’s what they had to say. Now you must remember that there are two elements to Disneyland Paris; the Disney Park and Walt Disney Studios and each can lay claim to the best restaurant at Disneyland Paris. But there is nothing better than hearing recommendations from those who have been. Who better to advise you on the best place to eat at Disneyland Paris than families who have already been with their kids. 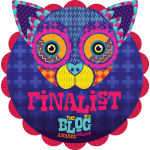 Here’s what my fellow bloggers had to say. Kerry from Kerry Louise Norris’ favourite place to eat is Chez Remy. Her girls love it too as it is quite a themed restaurant. In her opinion it’s the best restaurant in Disneyland Paris. Vikki from Family Travel with Ellie has written to blog posts about their dining experience at Auberge de Centrillon and what a Half-Board Dining Meal Plan will get you. The meal at the Auberge de Centrillon is the best place to meet the Disney Princesses, while half-board dining could be a good way to eat in a few places for either lunch or dinner. Some places that stick out from reading her post are Plaza Gardens, Chuck Wagon and the Cowboy Cookout BBQ. Was amazing, by far our favourite place to eat. Her family also enjoyed their meals at the Plaza Gardens and Buffalo Bills. But they unfortunately had bad experiences at Café Mickey and Auberge de Centrillon. Although they only ate at Disney eateries as they had a full-board meal plan, they have heard Vapiano, just outside the Disney Village, is a good place to eat. Nicola from All Things Spliced always tries to eat at either the Rainforest Café Disneyland Paris (with the animals) or at Annette’s Diner (think waitresses on roller skates). Although she did warn that the service can be very slow in both places, despite the staff being very helpful. Perhaps not ones to visit with hungry and impatient under 5’s? Beth from Twinderelmo loved Hakuna Matata, whose chips are divine. Her family also loved the Rainforest Café. They visited there at 4pm one afternoon and it was quite empty and the service and atmosphere was amazing. So, perhaps that’s the best time to visit there with little ones. Nat from Awaybies has also heard good things about Vapiano, outside the Disney Village. She also wrote a brilliant post, 9 of the Best Restaurants for Family Dining at Disneyland Paris. Some of the places she suggests for the best food at Disneyland Paris that stuck out for me were Chez Remy, Inventions, Restaurant Des Stars and Steakhouse. 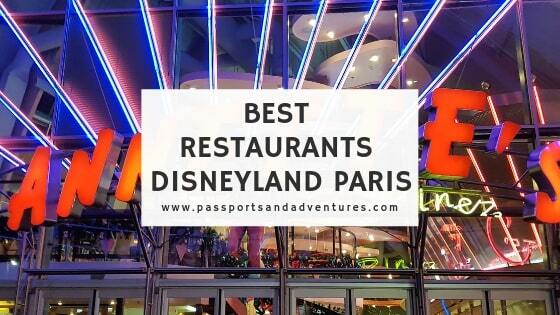 In the first section below you will find a list of the best restaurants in the Disney Park of Disneyland Paris, while the second concentrates on the best places for food in the Walt Disney Studios of Disneyland Paris. There are also an abundance of places to eat in the Disney Village and quite a few of those got a thumbs up from my fellow bloggers. So there’s a dedicated section for them too. There are five different areas to the Disney Park, each with a number of restaurants to choose from. It is here that you will find the best restaurant in Disneyland Paris to meet the Disney Princesses, and also where you can enjoy some fine dining at Disneyland Paris. Located in Fantasyland is Disney Park, this is a character dining experience restaurant where guests get to meet Disney Princesses, as well as some of Cinderella’s mice friends, while dining on fine French cuisine. It is by far the best place to eat in Disneyland Paris if you have a Disney Princess fan on your hands. Just remember to dress them in their best princess costume for maximum interaction chances with the characters. Located in the Disney Park, this restaurant hosts character breakfast as well as buffet meals. Dine amongst Victorian splendour and enjoy an international menu. It is one of the best Disneyland Paris food places where you can meet a large number of the characters, get their autograph and have a picture taken with them, all while enjoying a buffet breakfast. Located in Frontierland, this counter service eatery offers Tex-Mex food a little less costly than some of the other eateries. It is also one of the best Disneyland Restaurants for toddlers due to it being a quick service restaurant. Handy for the young members of the party who don’t want to wait ages for their food. Another counter service restaurant, Hakuna Matata is located in Adventureland in the Disney Park, where an international menu is on offer. Another one for visiting with little ones if you don’t want a table service restaurant. This restaurant is located in the Disney Hotel, at the entrance to the Disney Park, and is another of the Disneyland Paris restaurants where some character dining happens. A balanced breakfast buffet is on offer, along with contemporary specialities for lunch and dinner. 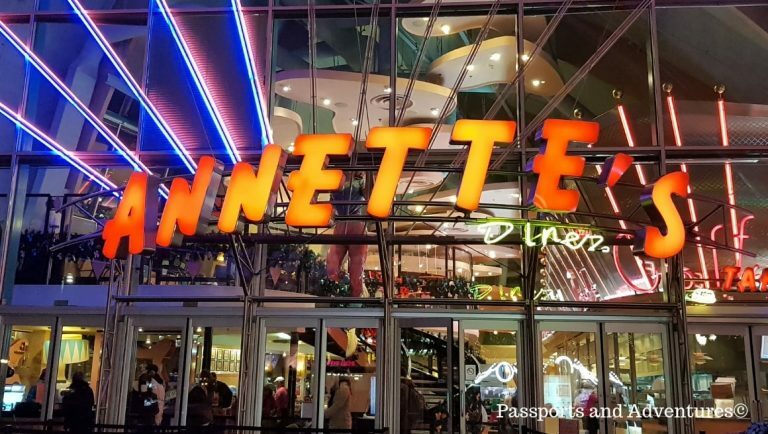 There are a few restaurants located within the Walt Disney Studios Park, and it is within this park that many argue it where you will find THE best place to eat in Disneyland Paris. 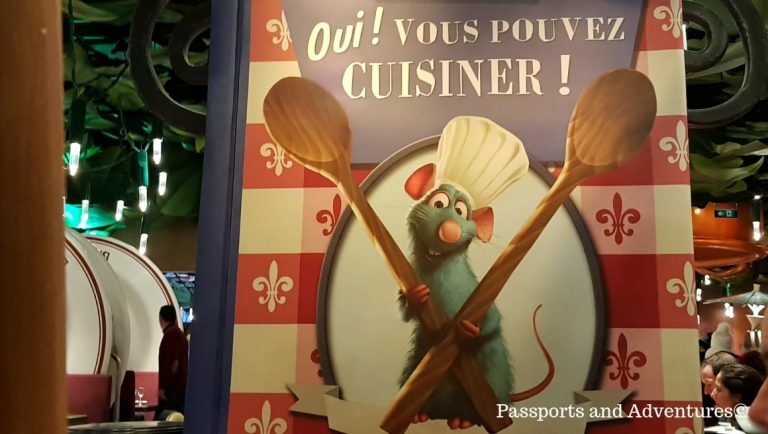 Located in Walt Disney Studios, this Ratatouille-themed restaurant is a table service restaurant serving traditional French cuisine. With giant corks for chairs and jam jars for tables, you’ll get a rat’s eye view of this larger-than-life eatery. This restaurant always comes highly recommended for the best Disneyland Paris food, all while enjoying the rat-themed ambiance. A buffet-style restaurant serving an international menu, Restaurant Des Stars is situated in Walt Disney Studios. Famous faces from films adorn the wall in this classy French buffet restaurant. You’ll find the highest concentration of restaurants in one small location, the Disney Village. Situated between the two parks, there are a number of different restaurants and places to eat located within the Village. A few in this area have been recommended as having the best food places in Disneyland Paris. This table service restaurant is in the Disney Village and serves an exotic menu. Set deep in the Amazon rainforest, you can dine in the company of animated animals and to the sounds of singing birds, trumpeting elephants and thunder claps. Another table service restaurant in the Disney Village, an American-diner style menu is on offer here. Enjoy your meal from servers on skates while great tunes come from the jukebox. A dining show experience, located in the Disney Village, you’ll enjoy a Wild West show from Mickey and friends while chomping down on Tex-Mex food. A table service restaurant serving grilled specialities, this eatery is located in the Disney Village and is styled as a downtown Chicago jazz restaurant. Located in the Disney Village, as the name suggests, this is a pasta and pizza bar offering Italian and Mediterranean dishes suitable for all the family. Emma from Wanderlust and Wet Wipes went to Disney in LA. While not Paris, she does recommend taking your own snacks and planning your day, so you know where and what you want to eat in advance. It may seem a bit crazy but not all the places serve the same things. So, if you fancy something healthy but the kids want chicken nuggets, you’ll save time and your sanity by planning meals in advance. She also recommends eating at off peak times to try and avoid the lunchtime rush. Ensure you book the most popular restaurants ahead of time. Bookings can be made 60 days in advance of your stay. A meal plan is advisable and half-board will probably suffice. Eat at unusual times, such as around the times of the parade in the Disney Park. Most people will be watching it so some restaurants will be quiet and have availability. If you have a Plus meal plan you can eat in more restaurants than the Standard meal plan. Premium gives you access to all the restaurants including the fine dining, character experiences. You can eat off the meal plan you have, you will just need to pay the difference if upgrading. Note that the prices quoted in the menus do not equal the value of your meal plan voucher. It is usually lower in value than the meal price quoted. Confirm your bookings a few days ahead of your visit to ensure you remember the correct time to arrive. Although we had a breakfast meal booked with our hotel, and a character breakfast, I considered changing to a half-board option to give us some options inside the park for lunch or dinner. I can remember, during one of our previous visits, my husband and I ended up in Toad Hall for fish and chips and it was one of the worst meals we ever had, anywhere. So I thought maybe some forward planning might be prudent. And I definitely wanted a meal at Chez Remy as it seemed to be the one that many people loved. 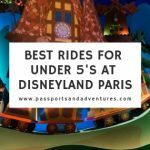 You can read more about planning a trip to Disneyland Paris with kids, with hints, tips and secrets to having the best time in this blog post. I must say a big thank you to everyone who gave us some recommendations as to the best places to eat at Disneyland Paris. It seems Disneyland Paris dining is a minefield. It’s hard to know where to eat in Disneyland Paris and which are the best places for food in Disneyland Paris. We had a lot to choose from before our trip, and after consulting with our friends, picked what we believed would be the best places to take the kids for food during our trip. All that was left to do was make reservations in time for our trip to Disneyland Paris that December. Are there any other Disneyland Paris restaurants you would recommend that haven’t been included? Likewise, anywhere you would recommend be avoided? I’d love to hear them. Was in Disney Paris last summer. Have to agree with what most people say , food is pretty poor. We had breakfast included in our Disney Hotel package, so needless to say in the mornings we used to make sure we were well fed, and I used to make rolls at breakfast to bring with us for lunch later on. Also , plenty of fruit etc. You can also fill up water bottles as even the water is very expensive inside the park . We didn’t book dinner in the hotel we were staying in, as we didn’t want to be tied into having being back at the hotel every evening for dinner. The food in Disney is pretty expensive alright. All fast food type places, but we were only there for5 days and considering we were in Disney we didn’t mind so much. We did the Buffalo Bill show one of the nights where our dinner was included. Would defo recommend this show. Loved it, and the food was good too. Enjoy your trip! Thanks Shirley. I appreciate your comment. We’re debating on whether we go full board as we have breakfast included. It’s a tough one. But thanks for your tips! We didn’t really eat out at Disneyland Paris, more because the children are still so small. Hopefully we can go back when they are slightly older and explore the restaurants a bit more. I’d love to hear how your trip goes – dying to take the kids to Disneyland Paris soon! We’ve never been to Disneyland, but if we do ever go this will be useful. I’m glad you thought it was useful. I wanted to be well researched before we went. It’s different when it’s just you as a couple and no kids involved. Oh thanks Kaz. I’ll make a note of those! Such great tips here. Although I agree with Emma – always have the snack handy. I’ve never been to Disneyland and didn’t realise you had to book restaurants! Yes, neither did I till we planned our trip. The best ones are booked up as soon as the booking system opens. We’re going in June and have opted for half board…am wondering what is the best time to book a table for dinner? Do we stop for dinner at 6 and then carry on with more rides etc or do everything the dinner and bed!? Any other questions just shout! We’re going for 4 nights, my kids will have just turned 7. May catch parade then on first day (we arrive on eurostar at 2) and back to hotel for late dinner @ 9. One night we also have buffalo bill booked. So just leaves 2 days to think about…. We’re going for 4 nights with x2 7 year olds. DAY 1 We arrive at 2pm on the eurostar so will drop of bags at hotel and head to disneyland park and catch the parade at 5. Will then head back to hotel for late dinner/bed. DAY 2 See the illuminations which I think arn’t till 9.30 so will book an early dinner…should we book back at hotel (Newport) refresh and go back to park or eat inside park and carry on?? DAY 3 We already have buffalo bill booked for second show at 9.30. We were there in December so Illuminations were at 7pm for us. So we ate before then between 4 and 5pm, got into place for 6.30pm and waited around until everyone was gone for the night-time castle picture before heading back to our hotel for bed. As your kids are older than our son was, you’ll probably find things a bit more flexible than us. For Day 1, I would definitely book dinner in your hotel to ensure you have something secured. You might be feeling tired after travelling so book it for after the parade, allowing time to get back. For Day 2, I’d book one of the restaurants within the parks, depending on what ones you’d like to eat in. For me, it’d be Pirates of the Caribbean in Disney or Bistro Chez Remy in Studios. With your kids being a bit older, I’d stay in the park, eat and enjoy more rides until Illuminations. Day 4 – I’d eat in another restaurant within the park, say the other one which might be top of your list. Personally, as you’ve got half board, I’d fill up on breakfast, take snacks for during the day/or get a coffee and cake if peckish, and eat around 5pm if that’s when the main parade is on. Alternatively, book for 6pm just after and enjoy more rides afterwards until the park closes to maximise your time there. You can always have another snack when you get back to your hotel. I brought lots with me in our suitcases, and didn’t end up using most of it. We were too busy enjoying rides and doing things to think about our stomachs, plus as most meals were 3-course, we were full afterwards.